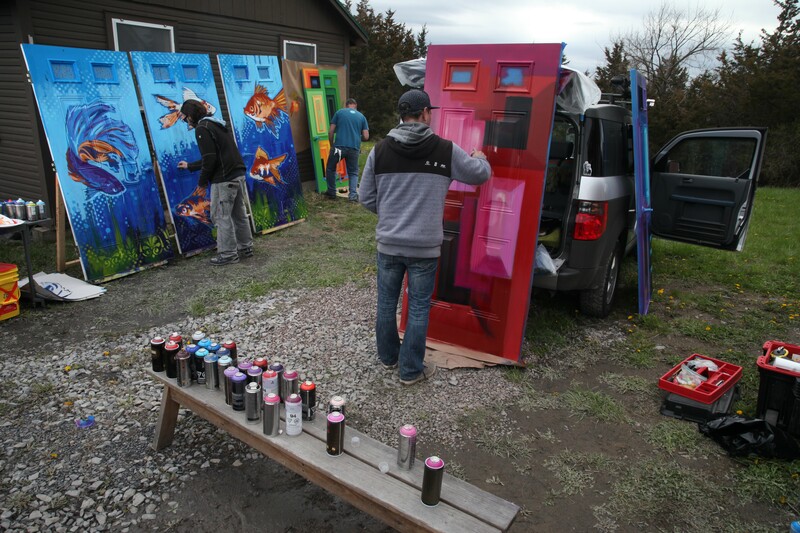 Left to right: Jon Young, Brian Clark and Scottie Raymond paint doors at Camp Ta-Kum-Ta. 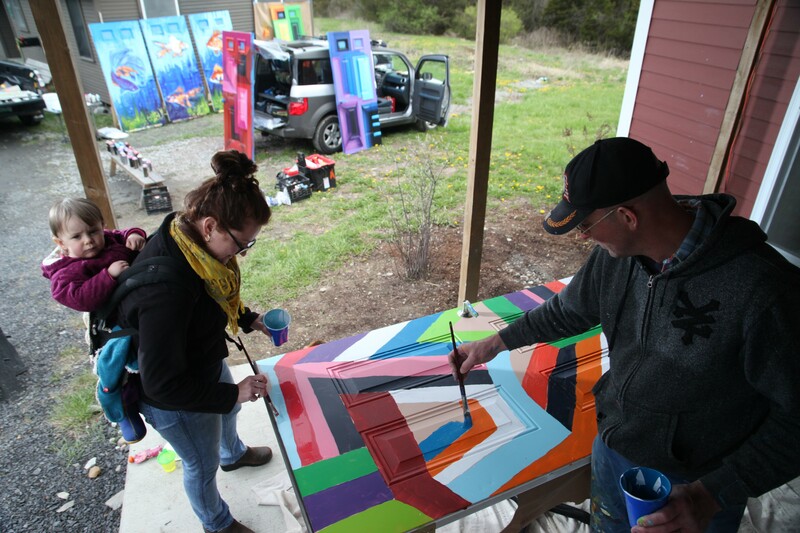 Gray skies didn't dampen the spirit at Camp Ta-Kum-Ta in South Hero on Wednesday, as 10 artists put their brushes to somewhat unusual "canvases." Their goal? To transform the cabin doors into whimsical portals to, perhaps, a happier world. That's because Camp TKT serves a select population: kids battling cancer. But that doesn't prevent it from offering arts and crafts, swimming, a ropes course and other typical summer-camp activities. 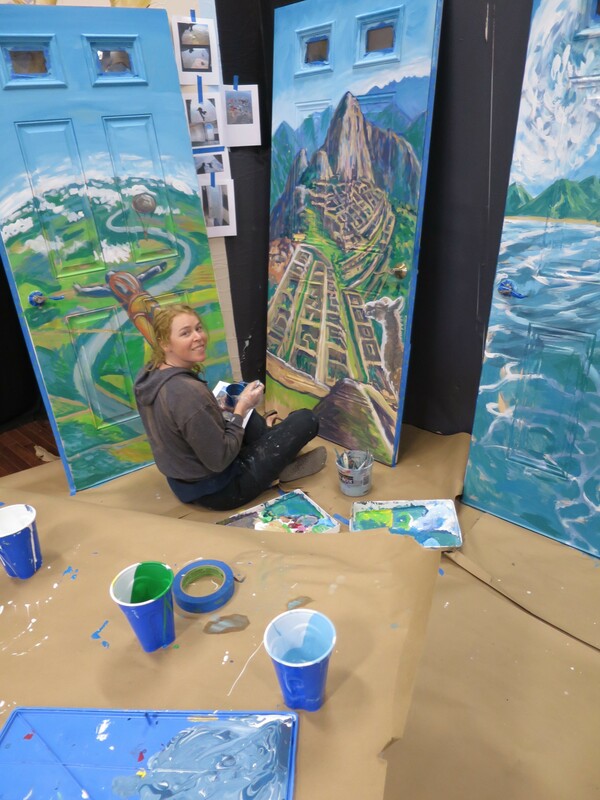 Aptly named "The Portal Painting Project," the door-painting venture was conceived by Jill Badolato, who heads up Dealer.com's corporate responsibility program. (The project is funded by Dealer.) The petite power-house, who has organized employee volunteer days at Ta-Kum-Ta for the past three years, says she sees potential canvases everywhere. The drab doors of the camp cabins were just too good to pass up. 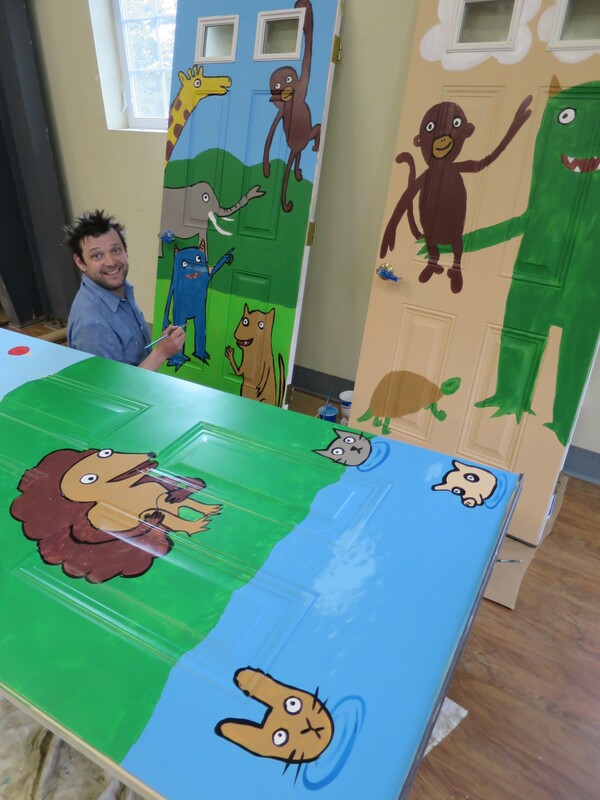 Badolato said the only stipulation of the portal-painting project was to make the doors "extra happy." The kids already have enough to deal with, she reasoned. And so she rallied artists — many of whom have worked with Dealer in the past — she knew would rise to the occasion. "[Painting] is therapeutic for me," Terrat added, "and hopefully [the finished product] is therapeutic for the campers." Next to Terrat's station, Tara Goreau leapt into a skydiving scene, as well as a view of Machu Picchu and a surfer riding a "perfect" wave. During a quick break, Goreau said she was drawn to those images because she'd been "jonesing" for an adventure. Her murals do inspire a sense of wonder and a longing for travel; if the goal was to create portals, Goreau succeeded. For the most part, the doors remain true to each artist's individual style while giving off a family-friendly vibe. James Bellizia noted that the elephant, giraffe and monkeys in his murals were inspired by his 1-and-a-half-year-old son. "He's really into animals," the artist explained as he applied blue paint to a figure named "Monster," which appears throughout his work. "I've been reading a lot of kids' books and hanging out with him, and I decided to keep going with that for this [project]," he said. If there was ever occasion for paternal sentimentalism in art, this might be it. The doors will open for about 75 campers in late July. "They are going to be astonished," said program manager Dina Dattilio. "This is going to be such a magical surprise for them." Director of development Lindsay Longe, watching the vibrant scene unfold from the sidelines, exclaimed, "It's spectacular; it's better than we ever could have imagined." 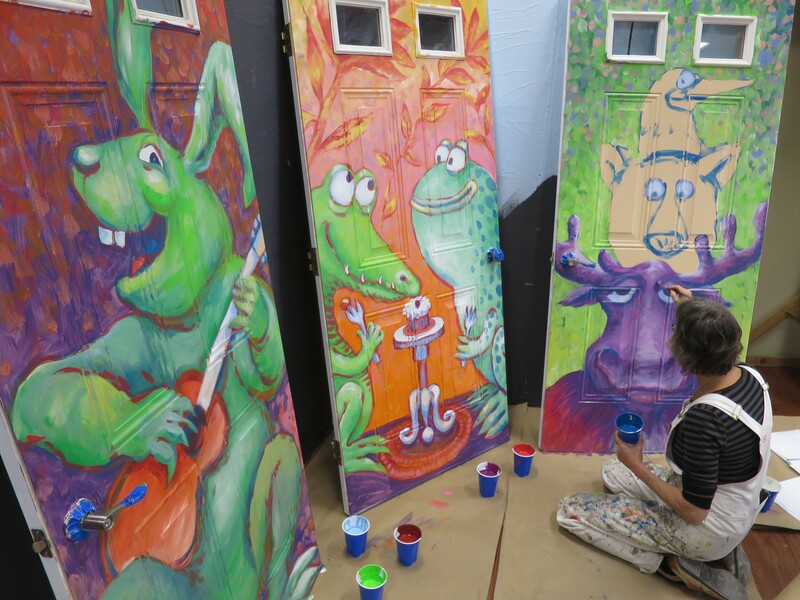 Other artists in the "Portal Painting Project" include Elvira Tripp-O'Leary, Max Hodgson, Mary Lacy, Brian Clark and Scottie Raymond of Anthill Collective, Jon Young, Clark Derbes and Wylie Sofia Garcia. *May 6, 2016: This post has been updated to include Elvira Tripp-O'Leary in the list of participating artists.